Citing complaints, Oakland police shut down the weekly street-food gathering Bites on Broadway Friday. Organizer Karen Hester told What the Fork an officer approached her at about 5:30 p.m. — shortly after the seven assembled food vendors opened for business — and told her vendors would have to disperse. Hester acknowledged to WTF that there’s been at least one neighbor complaint about the Friday night street-food event, which launched June 10. A community organizer behind annual events like the Temescal and Rockridge street fairs, Hester was operating Bites on Broadway without permits, though she claimed she had the informal support of the city, police, and some Oakland school officials. Hester had originally hoped to get permission from the Oakland Unified School District to site the event on the grounds of Oakland Technical High School. When that didn’t happen, Bites on Broadway set up instead on 45th Street at Broadway, along Oakland Tech’s northern perimeter, turning the school’s strip of lawn into an impromptu picnic ground. 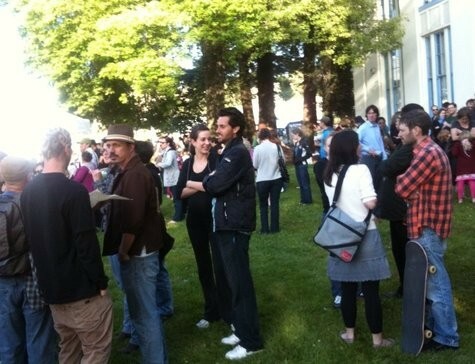 In three weekly appearances, Bites on Broadway attracted big crowds to Oakland Tech's 45th-Street lawn. What the Fork stopped by Bites on Broadway at about 4:45 p.m. Friday, as vendors were setting up in the street. It was then that Hester told us the police and the city of Oakland had informed her about the neighborhood complaint (or complaints — it wasn’t clear how many had been lodged), but seemed confident she could resolve the issue at a meeting with Oakland police tentatively scheduled for this week. Asked if she thought the complaint (or complaints) had to do with vendors’ partial blockage of 45th Street, with noise, or trash, Hester declined to speculate. She said she’d already started a petition drive to demonstrate support for the event. The weekly gathering has proved popular. In the three weeks it operated before Friday’s shutdown, it regularly attracted hundreds of people willing to endure long waits in line for food from vendors such as Fist of Flour, Nick’s Wheely Good Breakfast Truck, and Sue’s Sassy Pies. A commenter on the Temescal Community Group message boardsuggested last night that an OPD officer seemed “quite apologetic” about Friday’s shutdown, citing “a neighbor’s complaint.” Oakland’s current ordinances don’t allow mobile food vendors to cluster, as they did for Bites on Broadway. Vendors at annual events like street fairs and the Eat Real Festival operate under different permits. Hester seemed confident that Bites in Broadway could return, though she said it might be “overly optimistic” to think it’ll be back this Friday. She said she hoped to meet with city officials today or tomorrow. Get in touch at John.Birdsall@EastBayExpress.com, and follow me on Twitter @John_Birdsall.